Eric asks: Who invented the food pyramid? The very first “food pyramid” was a Swedish invention and it was an invention of necessity more than anything else. Back in 1970s, Sweden saw its country gripped by high food prices. The government then tasked The Socialstyrelsen (National Board of Health and Welfare) with coming up with a way to help the situation. In response to this, in 1972, they came up with “basic” and “supplementary” foods- in a nutshell basic foods were foods considered essential to a person’s well-being and supplementary foods were foods that provided vitamins and minerals basic foods did not. However, it was one, Anna Britt Agnsäter, working for Kooperativa Förbundet (Swedish Co-operative Union- a retail/grocery co-operative), who really pushed the idea to the next level. Though the Socialstyrelsen’s basic foods idea was a good one, Anna felt that it could be improved upon and developed an idea of a triangular model to better visualize the portions. The scheme was officially unveiled to the Swedish populace in Kooperativa Förbundet’s annual magazine, under the headline “Good wholesome food at reasonable prices“. An important thing to note is that the Socialstyrelsen and by extension the Swedish government itself sought to distance itself from the pyramid in lieu of using a “dietary circle” model, not unlike one already used by the USDA (United States Department of Agriculture). 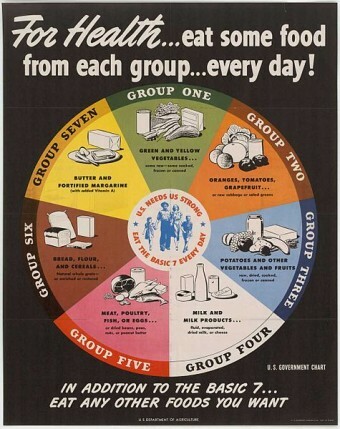 This circular model, though useful for representing what foods were important, was criticized for not explicitly showing how much of each food type should be consumed, something the pyramid model did in a simple and visually striking way. Now if you take a quick look at the original pyramid, you may notice that there are some stark differences with the more Westernized model you’re likely familiar with. There’s a reason for this beyond simply a more modern understanding of nutrition and health- pressure from lobbyists and heavy hitters in the food industry. You see, the food pyramid stood to be the go-to standard millions of Americans would base their entire diet around and billions of dollars were at stake. For example, you may notice that in the earliest 1992 version in America, dairy gets its own section, whereas in the Swedish version it is simply bundled along with the other staple foods. This isn’t an accident and subconsciously this suggests that dairy is an essential part of one’s diet, which is obviously not true since many cultures throughout history got along perfectly fine without non-human milk, as do vegans and others today. If you are guessing that entities within the dairy industry lobbied hard for this modification, it’s generally thought that you’re correct. 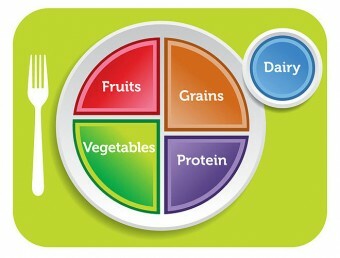 You may also notice that the original American pyramid suggest 6-11 servings of bread, cereal, rice and pasta per day. Which is, well, a hell of a lot if you actually think about it. 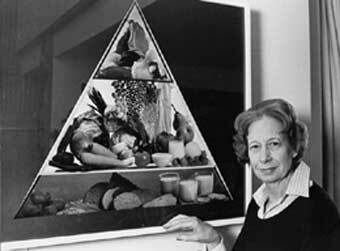 According to Luise Light, one of the people who worked for the USDA during the time the pyramid was being developed, this was due to interference from food industry giants as well. How does she know this? Well, she was the leader of a group of top nutritionists who developed the original food pyramid for the United States before it got “sold to the highest bidder” as she put it. Where we, the USDA nutritionists, called for a base of 5-9 servings of fresh fruits and vegetables a day, it was replaced with a paltry 2-3 servings (changed to 5-7 servings a couple of years later because an anti-cancer campaign by another government agency, the National Cancer Institute, forced the USDA to adopt the higher standard). Our recommendation of 3-4 daily servings of whole-grain breads and cereals was changed to a whopping 6-11 servings forming the base of the Food Pyramid as a concession to the processed wheat and corn industries. Moreover, my nutritionist group had placed baked goods made with white flour — including crackers, sweets and other low-nutrient foods laden with sugars and fats — at the peak of the pyramid, recommending that they be eaten sparingly. To our alarm, in the “revised” Food Guide, they were now made part of the Pyramid’s base. And, in yet one more assault on dietary logic, changes were made to the wording of the dietary guidelines from “eat less” to “avoid too much,” giving a nod to the processed-food industry interests by not limiting highly profitable “fun foods” (junk foods by any other name) that might affect the bottom line of food companies. Unsurprisingly, as noted in The Wall Street Journal, obesity rates have increased ever since the introduction of the food pyramid, aka the day millions of people suddenly thought eating eleventy billion slices of white bread per day was healthy. Now, correlation does not equal causation and it’s likely there are a lot of other factors in play here, but the Food Pyramid probably hasn’t helped. Even if for some reason you don’t believe Luise and others who were involved and more or less make the same claims, the USDA has certainly made a lot of questionable decisions with regards to nutrition recommendations. When the pyramid was being revised in 1995, they were under pressure to alter the wording of the pyramid to say “eat less salt and sugar“. The sugar barons of the time fought this change and when the revised pyramid was released, it advised people to eat less salt, but “moderate” their sugar intake. After more than 150 random clinical trials and 13 population studies without an obvious signal in favor of sodium reduction, another position could be to accept that such a signal may not exist. So, in the end, the Western food pyramid is a lot like breasts. Everyone was happy with the all natural Swedish ones, right up until America filled them with chemicals and claimed it was better that way… 😉 Seriously though, if you build your core diet around eating lots of vegetables as well as moderate amounts of whole grains, lean proteins, fruits, and sources of unsaturated fats, all the while watching your overall caloric intake and exercising regularly, you’ll probably be in the ballpark of “healthy”. If you’re curious what a much better food pyramid than the USDA’s version- and better than the USDA’s more recent “MyPlate” that has replaced the “MyPyramid”- check out Harvard’s version from their Department of Nutrition. Nothing’s perfect, but it’s pretty darn good and certainly beats the version created to pander to various major food industry groups. How Much Water Should a Person Drink Daily? The USDA’s first nutrition guidelines go all the way back to 1894. These essentially were: moderation in everything, eat a variety of nutrition-rich foods, watch your portion size, and avoid eating too much fat. That’s not a bad guide actually. In 1943, the USDA updated this with their “Basic 7”, which was spurred on by wartime rationing, and heavily influenced by this. Essentially, these basic seven were: green and yellow vegetables; oranges, tomatoes, grapefruit, raw cabbage or salad greens; potatoes, fruits and vegetables; milk based products; meat and eggs; bread, flour, and cereals; and butter or margarine…. Their first guide was better. In 1956, they updated this, now going with “The Basic Four”: “vegetables and fruits”, milk, meat, and “cereals and breads”. This was the recommendation until they introduced their version of the Food Pyramid in 1992. Since 1980, the USDA also has produced much more detailed nutrition guides than the quick-fix picture versions, with the most recent version of the full guide revised in 2010. However, like their food pyramid and MyPlate, they seem to be heavily influenced by various groups within the agriculture industry. What is a Food Pyramid? From the above article: “For example, you may notice that in the earliest 1992 version in America, dairy gets its own section …” YIKES! I just hate this misuse of the word, “dairy,” as though it could be a noun within the quoted sentence. Until just a few years ago, the average person had never dreamed of using anything but the correct term, “dairy products,” in the above context. Some people now are so incredibly lazy (or artificially rushed) that they are chopping keys words out of phrases. As even a modern dictionary shows (http://education.yahoo.com/reference/dictionary/entry/dairy), the noun, “dairy,” is NOT a synonym for “dairy products.” Folks, please have the courage to fight against the “twitter mentality” (a shambles of short cuts). Language evolves, which I am quite sure you know since you have an unabashed interest in word usage. THIS FOOL SPOILT MY MOOD SO FORGOT 2 SAY…..TNX KARL FOR A WELL RESEARCHED WRITE, SRRY, RITE. And people wonder why America is obese? I can’t help but notice how much blame is put on to the lobbing groups, it make no mention on the government . The lobbing groups did the changes that benefited their cause because they paid somebody off and were allowed to do what they wanted. This is what happens when the government, who thinks they should tell you how to live your life and babysit you, gets involved. Everybody is different, and what the government does best is generalize to include “all Americans” in their plans. Even the current version of the food pyramid is innacurate and far from what works for each individual. Don’t forget that pizza is considered a vegetable by our government so eat as many servings of that as they recommend you to eat. Aren’t you coming down on the wrong side of your own argument? Lobby groups are privately hired ambassadors for private companies which take advantage of the way government works to their own corporate end. If anything, it shows the fundamental flaws with an unregulated lobby system. If the FDA were strictly science based, we wouldn’t have had the food pyramid problem in the first place and without FDA restrictions, we’d not only have our current problem, but also we’d have things like the meat and dairy industries playing TV commercials telling you hot dogs cure cancer like the way they did with cigarettes in the 50s and 60s. Actually I suppose it was easy to misinterpret the original commenters point. I believe his point is, that if you have a government that has some value that an industry wants to buy then the industry will do it’s best to buy it. The problem isn’t a business trying to get it’s best advantage it’s that government, with it’s powers to regulate is pretty much always for sale. If it couldn’t regulate, and didn’t even bother to suggest things that it really hasn’t ever been given authority to, then industry would have no interest in buying that influence that doesn’t exist. Here is another blunder of the FDA: the nutritional panels. Those neat percentages that help you gauge how much of you basic nutrients a food is providing… well those are a bit out dated. The numbers that those are based are from recommendations (RDAs) from 1968. Think we haven’t learned anything since then? There have been updates as recent as the past few years (I believe calcium was updated in 2010 or something like that). And these haven’t just been subtle changes. The DVs (daily values), which is what the percentages are based on, are very different than what we know for some nutrients. For example: the DV for carbs is 300g. Today the current RDA is 130g, less than half of the DV! Of course there is much debate over over what the ratio of fat:protein:carb should be, but 300g would provide about nearly 60% of your calories in a 2000 calorie diet. Even the most generous recommendation can’t pretend that is good. I think that the nutrition panel would be a great topic for you guys to cover. Historically and epidemiologically healthy diets have always, always been above 50% carbohydrates. There is no even halfway healthy human population recorded eating less carbs than this. None. Nowhere. At any time. The Masai and Inuit have terrible heart disease on traditional diets. True, they don’t get cancer, but they don’t live long enough for that. The emphasis on the hunter in “hunter gatherer” is a reflection not of reality but of misogyny. Little attention was paid the the much calorically greater contributions of women–who overwhelmingly supplied and supply starches. There were special words for meat hunger in many languages because meat hunger was a much more frequent thing than lacking food in an absolute way. Yes, the allowance for total fats should be increased to at least 35% of a diet, perhaps 40%, and minimum should be set at 15%, not 10%. But there is no such thing as a healthy long term low carb diet. And no society that wasn’t in the crappiest regions of the world ever lived on few carbs. People who didn’t even have wild grain used tubers and roots as their primary starch. Most cultures ate a whole lot of bland roots that were very reliable as food and extremely tedious to prepare. Every civilization ever was built on grain or roots for a reason. They are the fundamental foods of mankind. Meat in any decent climate is a critical supplement, but just that–a supplement. What falsities are you administrating Jennifer! Emphasis on “NO” heart disease. It is the curse of the modern American diet (containing far more refined carbohydrates and sugar) that has brought heart disease to these and all other unfortunate indigenous people wold wide. Tell me one ” special word for meat hunger”? The only way is could be misconstrued is the fact that; ” the importance of wild game went far beyond nutritional value and was a strong social value”. I think you must be a paid shrill to promote these preposterous notions. Great article! Thanks for promoting my work! Nice work. One small correction though. Obesity rates began climbing in the early 1980’s after the release of the first Dietary Guidelines for Americans, which set the standard nutrition pattern for a “healthy” diet on which the pyramid is based. The food pyramid wasn’t official until 1992. In many ways, the food pyramid was a response to, rather than a cause of, rising rates in obesity. That said, it sure didn’t slow them down any! Yes, but now we are finding that the “Food Pyramid” is upside down. “The human body NEEDS fats,” cried the faint voice in the fray. Wow. This was a terrible article. You do realize that a 100% natural vegan diet ends in death within about 10 years, right? Vitamin B12 isn’t optional. There is no such thing as a healthy, natural vegan diet. You can get away with eating vegan for longer than, say, eating no vitamin C, but they both end in death. And despite the constant carping of the anti-milk groups, milk is now served at ever Japanese school meal and is recommended by the WHO. That’s because it’s one of the most convenient packages of calcium out there. (We need much less in old age than many people think, though, but the reasons are complicated.). Also, the argument that the lactase enzyme is necessary for substantial milk digestion is untrue. As with beans, there are many happy bacteria thrilled to help a lactase deficient person digest milk. This just requires giving them small but regular amounts of milk. This is why milk, including in fresh forms, is a staple of Mongolian, Central Asian, Arab, North African, Masai, and Indian cuisines–where no one is lactase producing. That’s not to say all dairy is good. Advanced glycation end products are exceptionally high in many hard cheeses. Dairy fat is also bad in more than modest amounts. Sugar added dairy is terrible–and really, the best would be skim unsweetened kefir or yogurt, where much of the natural sugar is consumed. The second big issue is the fact that you fail to address the fact that unsaturated fats don’t mean good fats. Most edible monounsaturated fats are probably good–several definitely are. But some PUFAs aren’t, at least beyond a certain level. Omega 6 oils are mostly not good–because of the excessive levels of consumption. Though there are two that are essential, high amounts of them and others have been linked to health issues, and their succeptibility to oxidation is part of that. Obviously, transfats (which are PUFAs) aren’t good. Most people eat too much omega 6 PUFAs and most used to eat too much saturated fats. (As some still do.). Traditional, historically high monosaturated fat diets based on olive oil are shown to be very healthy, as well as the omega 3 PUFAs you can only get in a usable form from fish and, to a much lesser extent, seaweed–yet there’s good reason to think that if we could eat a ton more omega 3s than a daily fish meal gets, it could be bad, too. (Oxidation of cell membranes is bad, bad news.). Also, fried foods aren’t good even in olive oil. Advanced glycation end products mess you up. The recommendations for grains, if they were WHOLE grains, wouldn’t actually be bad, though. Beans, whole grains, and chocolate have been the only foods strongly associated with great longevity in various studies. (Paleo freaks are as wrong as vegans!). In studies of cancer, heart disease, and dementia, the best foods to eat in higher than typical levels are generally olive oil, fish, vegetables, beans, and fruits but mostly dark purple/blue ones. The ones to eat less of than average are red meat, added sugar, fried foods, processed meats, and alcohol (the ones saying a little is good didn’t control for people abstaining due to medication or prior alcoholism). The knowledge of the 1980s just didn’t grasp any fine distinctions or subtlety. The third huge problem with this article is that you don’t seem to understand that obesity isn’t caused be eating unhealthy foods. It’s caused by eating too many calories. The biggest problem with the USDA pyramid AND the recommendations today is that it recommends waaay more calories than the average sedentary person needs. If America followed a 2000-calorie diet for women and 2500 for men, 95% would be obese. The average American woman would need to eat only 1500 to 1700 calories a day if she wanted to avoid being overweight. I’m taller than average (meaning I need more calories at the same body composition), and to break 2000 calories in a day, I have to walk 8.5 miles a day or walk 3 miles and do a very hard hour-long cross training session. If they’d just stop lying about reasonable calorie consumption for someone not doing manual labor all day, we would have a starting place. Argh!!! Forgot something. The studies are now pretty clear that seriously cutting salt will lower blood pressure. HOWEVER, this will most likely raise mortality. Only a small part of the problem with high blood pressure is that it’s high. This raises aneurysm risks. All the rest of the things wrong with high blood pressure are that your arteries are now inflexible clogged messes. Cutting salt only helps the first issue a little, which isn’t the biggest risk. Having healthy levels of an essential electrolyte is more important than fractionally lowering your aneurysm risk. Hence cutting sodium is a fool’s errand.